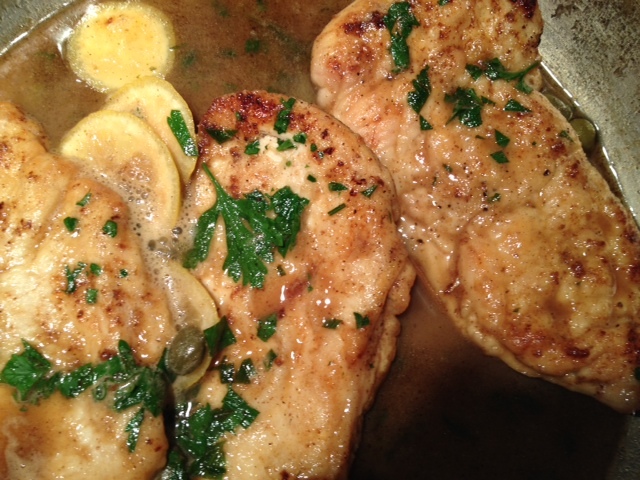 A quick favorite dinner and one of Michael’s favorites, Chicken Piccata. Easy preparation given that one can buy chicken cutlets or boneless skinless chicken breasts (slice in half and gently pound to an even thickness. Lightly dredge chicken pieces in the flour to coat, shaking off any excess. Melt 3 tablespoons of butter in a pan and sauté for 3-4 minutes per side without moving for a nicely browned crust. Set the cutlets on a warm platter and place in a warm oven or under heat lamp. While the pan is hot, deglaze with wine scraping up the little brown bits and pieces. Add the stock, lemon juice, capers and a few slices of lemon. Simmer for about ten minutes to reduce slightly, add the remaining butter, and stir. I dip the cutlets back into the sauce and remove to warm serving platter, pour sauce over and garnish with chopped parsley and extra lemon wedges. 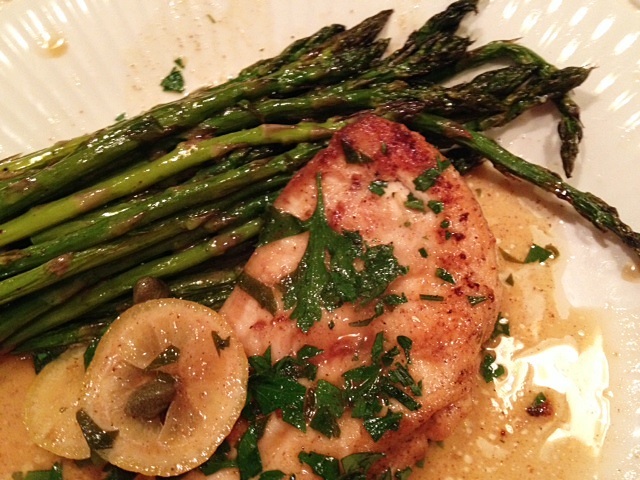 Serve with grilled or roasted asparagus.